RELIABLE PUBLIC POWER PROVIDER (RP3®): The American Public Power Association (APPA) has announced the Reliable Public Power Provider (RP3) awards for 2017. Marietta Power has been an RP3 recipient for seven years. 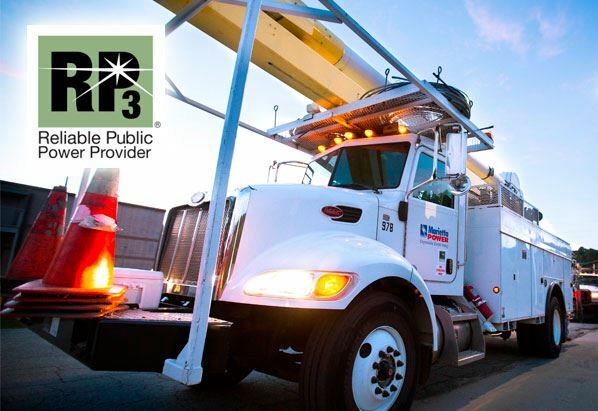 This is the second consecutive time Marietta Power has achieved the Diamond Level RP3 certification. The RP3 Award at the Diamond Level is the highest recognition attainable. The RP3 designation represents a high level of service to public power communities nationwide. Utilities who achieve this recognition stand out as models for safe and reliable utility operations. RP3 recognizes public power utilities that demonstrate proficiency in four key disciplines: reliability, safety, workforce development and system improvement. We are proud of the high quality of service our employees provide our Customers on a continual basis. This award and certification is a direct result of those efforts.